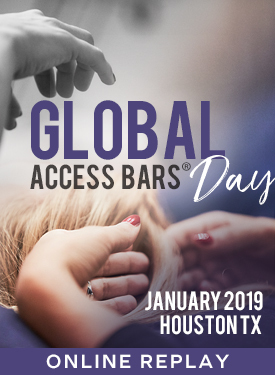 You’re invited to join tens of thousands of people around the world celebrating the 6th Annual Global Access Bars® Day that aired January 6-7, 2019. Facilitator: Enjoy the kick-off with Gary M. Douglas & Dr. Dain Heer and then Access Consciousness Certified Facilitators & Bars Facilitators around the world! What is Global Access Bars Day? Can you imagine what it would be like if tens of thousands of people around the world were running Access Bars on the same day? We can, and our aim is to create a global wave of consciousness, ease, joy, and glory! Would you like to be part of creating that global wave? Will you join us in celebrating the change and the consciousness that's possible in our world with Access Bars? You can still join with this amazing replay! The event was kicked off together with co-creators of Access Consciousness®, Gary Douglas and Dr. Dain Heer from Houston, Texas – then continued around the world to Europe and Australia for live events around the clock. It's YOUR choice... YOUR change... YOUR time to be a part of the creation of a totally different way of being in the world. The widespread goal of Access Consciousness is to create a world of consciousness and oneness. During this 6th annual Global Access Bars Day, our hope and target is to bring a sense of peace across the earth and with the people we love, in particular.